Capstone Flexi Time is a highly concentrated muesli style oat-free feed ideal for home mixers, and suitable for breeding, racing and performance horses. It is a versatile highly concentrated feed featuring premium quality micronized grains, quality protein sources, minerals and vitamins, and has been scientifically formulated to fulfil the nutritional requirements of breeding, racing and performance horses. Oat free: For the home mixer to add (ad lib) depending on energy level required. 20% Protein: High protein to meet the requirements of growing and breeding horses. Includes Lupins: Lupins provide a cool energy source of energy – high in protein and digestible fibre, but low in starch. Fully fortified: Meets all the protein, vitamin and mineral requirements of the equine athlete. 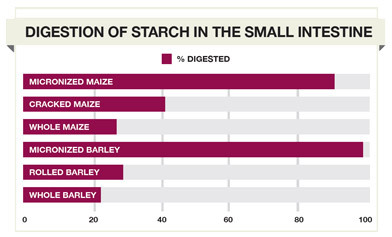 High in fat: Cool energy source that reduces the risk of starch overload of the hindgut. Fat also promotes coat shine. Capstone Flexi Time should be fed at the rate of 1.5kg (or 2.5 litres) to 2kg (or 3 litres) per horse per day. Capstone Flexi Time is designed to be fed as the sole grain portion of the ration, or with additional straight grains if more energy is required. Capstone Flexi Time can be used in a diet with all types of additional grains and forage and is designed to balance the diet regardless of other ingredients used, and the ratios in which they are added. Capstone Flexi Time should be fed in conjunction with a minimum of 1% of the horse’s bodyweight (5kg for a 500kg horse) of good quality roughage such as chaff or hay and/or pasture to provide a fibre source for optimal hindgut health. 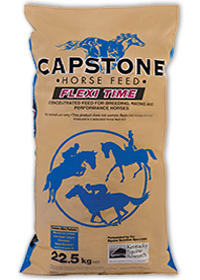 Because Capstone Flexi Time is a highly digestible, high energy, high protein feed, care should be taken not to overfeed horses confined to stables or not receiving regular exercise. Introduce Capstone Flexi Time to your horse’s diet gradually over a period of 4 to 7 days. During periods of heavy sweat loss, additional supplementation of a good quality electrolyte, such as Capstone Horse Electrolyte, is recommended. When Capstone Flexi Time is fed at recommended levels, no other supplement is required. Micronized Maize, Micronized Barley, Lupins, Canola Oil, Canola Meal, Full Fat Soya, Soya Meal, Sunflower Seeds, Sunflower Meal, Wheaten Bran, Molasses, Vegetable Oil, Salt, Feed Lime, Di Calphos, Chromium, Magnesium, Vitamin E, Vitamin & Mineral Premix, Live Yeast, Lysine.